1) Seth Abramson's blog post New Orleans: The View from Here. Intelligent and tough-minded reflections on the disaster, the media coverage, and the political implications of both. 2) Afflicted Powers: Capital and Spectacle in a New Age of War. This book, written by a quartet of San Francisco intellectuals (Iain Boal, T.J. Clark, Joseph Matthews, and Michael Watts) who collectively refer to themselves as "Retort," is the most brilliant and sustained analysis of our contemporary situation that I've encountered in book form. Last year a portion of the first chapter, "The State, the Spectacle, and September 11" was published on the Web by New Left Review. Not only is the book a devastating indictment of the imperial neo-liberal policy of the United States (now and for the past two hundred years), not only does it include a sharp and provocative analysis of our unwavering and irrational support for Israel's own version of imperialism, but it also contains a crucial chapter critiquing Islamic militancy, a subject that has been treated gingerly if at all by most critics on the Left. With an impressive fineness of touch the authors acknowledge Islamic radicalism as a genuine response to U.S. imperialism and the empty religion of consumer culture without falling into the trap of endorsing it or seeming to. They do this through a remarkable act of self-critique, explaining the Left's discomfort with the subject of an Islamist revolutionary movement by its homologies to the Left's own history of vanguard movements: Leninism, in a word, with its dismal history of unlimited human sacrifice in the name of a future paradise. The book's conclusion constitutes a rejection of vanguardism (Islamist or otherwise) and globalization both; the authors choose to wager the future on the actions of "the movement of movements," a vaguely defined amalgamation of the actions of "multitudes" against ongoing acts of "enclosure" (a term borrowed from English history for the lawless appropriation and reappropriation of resources once held in common: land, water, minerals, the airwaves, our very DNA). They get at least specific enough to cite some examples of "multitude" action, such as the Zapatista movement in Chiapassomething I now feel compelled to learn more about. As far as I can tell the book has received little attention as of yet (it was published in June) but hopefully that will change: everyone with Left/materialist commitments should be reading and discussing and critiquing it. Absolutely ghastly. The City That Care Remembered. It looks like New Orleans was spared the worst, though the bad is still pretty bad. The flooding I've seen images of doesn't seem much higher than what I experienced when I was there in 1995. One of the most badly hit neighborhoods is the very poor Ninth Ward (an area that linguistically smacks more of Bayonne than the Deep South, as in "da Nint' Ward"); one report I saw described it as "economically devasted" before the storm had hit. If anything good comes from Katrina, it might be federal money to rebuild the Ninth Ward as a decent place to live. Following the hurricane news with mingled horror and fascination, tinged with an odd nostalgia: I lived in New Orleans for three years and survived at least one flood, when heavy rain filled the bowl of the city faster than it could be pumped out. I'll never forget sitting on the porch of my house and watching people go by in boats and canoes. Hoping that somehow something will shift and the city will be spared. It's very poor, violent, rife with inequality, and a magnet for obnoxious tourists; it's also a feast for the senses, a hothouse for strange spiritualities, a relatively inexpensive place for art and artists, and one of the most beautiful places I've lived. Aside from the awfulness of the human cost of Katrina, it will be a source of immense sadness if that most Carribbean of American cities ends up wiped from the face of the earth. All right, folks, get your Fascicle while it's hot. Like any literary magazine it's a labor of love, but the social networks that traverse Fascicle make it resemble something almost undreamed of in American poetry: organized labor (and, given the extraordinary range of translations on offer, labor that knows how to sing the "Internationale"). All this plus a highly readable and screen-friendly format. I think it's going to be one of the most important Web-based magazines out there. In this situation, the subjective consciousness of the contemporary composer cries out for relief from the tremendous burden of being alone and unsupported in the task of grappling with the historical situation. In support of this notion of the overwhelming burden of authentic composition for the contemporary composer, Adorno cites Webern's very short pieces and Berg's very limited outpout, as well as Schoenberg's long silence after the intense short period in which he composed the Erwartung. In this light, systematization and rationalization along the lines of serial music become a form of relief for the composer, as does aleatory music with its randomization. In both cases, the moment of subjective grappling with the material is liquidated, which achieves the same result as the assimilation of the dead totemic "classics" to the prestige circuits or the culture industry. Music becomes what Adorno calls ichfremd"ego-alien." But given that the compositorial subject must still have some intention of creating something coherent, even if it is the coherence of fragments, something that the responding subject can "follow along" with, it is not clear what is possible (45-46). Similarly, the listener, who must be able to follow the particular in its quasi-logical relationship to the whole at any point, likewise without the support of tonality, must have a degree of concentration that will be as overwhelming a burden on him as it is on the composer. There is no longer any preestablished harmony between the general and the particular such as tonality afforded: "The perceiving ear, attuned to that harmony, feels itself overwhelmed when it has to follow unaided the specific processes in the individual composition in which the relationship of the general and the particular at any particular point" ([Adorno's essay] "Difficulties," 283). This demand for increased concentration comes at a point and in a cultural system in which there is an increasing demand for sameness and repetition and a correlated hatred of otherness and difference. In this context, Adorno notes that the demand for "feeling" in music, which sees as, in reality, a demand not for feeling but for sameness, is a version of the anti-intellectual ressentiment that is both the expression of the individual's leveling and a response to the individual's being overwhelmed. In this situation, then, as the demands and difficulties entailed by enlightenment in the sense of increasing freedom from convention and the past become apparent, there is an increasing temptation to regress and to retreat to some kind of apparent security (46-47). I find this accurate and useful when transferred to the scene of experimental poetry today, if by "experimental poetry" we mean that poetry which feels "constrained by history to deal with the most advanced musical [poetic] material available. The 'musical material' does not mean the state of musical technology [that is, the most advanced techniques, borrowed from the Language poets or whomever], although that is not irrelevant to it, but rather was has alraedy been created for musical experience that is not eroded. In other words, it is what provides the experience of increasing freedom, openness, newnesswhat most demythologizes musical [poetic] conventions that were formally accepted without question" (33). While I feel sympathetic to those who demand more emotion from contemporary poetry, for some sort of newly sincere lyricism, I can't help but wonder if what's really being asked for is the familiar: emotion recognizable as such because it's delivered in a package whose novelty is entirely and deliberately superficial. Maybe it would be useful at this point to distinguish between emotion and affect: I can't pick up a magazine right now without reading poems clearly inscribed by or triggered by some sort of emotion, but what's comparatively rare are poems that register a palpable affect of fear, delight, affection, etc. What I'd like to see more of is a poetry based on the twin value-streams of obligation to its historical moment and the pursuit of increased freedom, but whose urgency and reason for being or reason for address (its occasion) carries an affective whallop. I want to be moved, but not necessarily in a familiar or comfortable direction. Kent Johnson's Lyric Poetry After Auschwitz is affective in this way (and let me also parenthetically point toward this excellent review of the book); other recent affective books that come to mind include Ben Lerner's justly praised The Lichtenberg Figures, Juliana Spahr's This Connection of Everyone with Lungs, Jennifer Moxley's technically unrecent Often Capitalpoets whose ambition is underwritten by urgency and who actually succeed in transmitting that urgency, moving at least this reader. I'm informed that Facsicle is not quite ready for prime time, so I've amended the link below. Hope your appetites are whetted nonetheless. First day of classes todayalso meeting with remaining committee members to discuss my Pound chapter. Started Zuk chapter in earnest yesterday. Onward, ever onward. She's back! And with an amazing long poem, too. Also amazed by the debut issue of Fasicle. At first glance it reminds me of an American Jacket, not that "American" means much given the wealth of translations. A terrific snapshot (archive may be the more accurate word) of our poetic moment. I jumped immediately to the interview between Dale Smith and Alan Gilbert: a sustained and sustaining conversation on the topic of what is to be done, which was posted in parts at the Possum Pouch last year. The speculation on intersections between metaphysical and social approaches to poetry is particularly relevant to where my head's at right now. And the conversation as a whole is a marvelous primer on the history of American poetics, particularly after 1989. Give me back my Yingpow! Neck-deep in Adorno and Zukofsky, and in Tim Woods' book The Poetics of the Limit, which brings them both together. For relief I turn to the new CARVE. The Coolidge poems are some of the most accessible and delightful and musical of his that I've seen for a while; apparently they are part of an as-yet unpublished mansucript. Fave line: "raw brand you find in malls"; fave poem: "Dylan Variations." 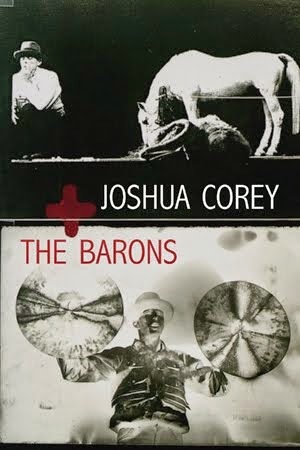 Dorothea Lasky produces odd, complex, and amusing anti-epiphanies about poetry itself as cover for the inchoate longings poetry itself covers. Fave line: "The St. Poet is annoying when he comes back eventually." Fave poem: "Against Cerebral Forms of Poetry." It's also exciting to see some of Mark Lamoureux's Astrometry Organon in print; he read some of these poems for SOON. Fave lines: "don't bring your wax fruit / to this temple, heliotrope." Emma Barnes and Bill Marsh, in very different ways, work the tension between line and sentence (in Marsh's case, word and letter). And I'm looking forward to CARVE Editions with chapbooks from Jess Mynes and Christopher Rizzo (also SOONsters). Right here in Ithacaa company town if ever there was onewe have our own organ for poetry unassimilated to institutions. It's a source of serious refreshment. Pre-semester malaise. Perfect weather and cloud armadas. The job market. Ack. For relief I turn to this interview with CARVE editor and partner-in-crime Aaron Tieger, talking about his responsibilities "as editor and an anarchist." Good gravy, of course there's new stuff on the literary front. Namely on Saturday we kicked off the new season of SOON readings with two stellar Ithaca poets, Katherine Lucas Anderson and Fred Muratori. Both put on great shows: Katherine announced it was her first reading since college but her perfrormance was compelling and confident. Fred's poems were presented with wry, hardboiled humor: he's working on a long series of prose poems that play off of the conventions of film noir in unexpected ways. Next up in the series: none other than Jordan Davis and his Million Poems Show, with special guest Ange Mlinko. We are very excited about this: stayed tuned to soonproductions.org for details. Also exciting: the new issue of CARVE, which I'll mention again in case you haven't got a copy. Only browsed through it so far, but as always I'm impressed with how generous the magazine is with each of its poets (each gets at least four poems per issue), while remaining accessibly chapbook-sized. I am toting both it and Logopoeia everywhere I go. 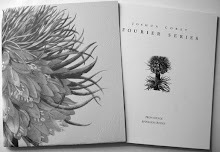 There's a new review of Fourier Series by Paul Johnson up at Jacket. I couldn't be happier with it. Intensely beautiful weather: a slice of the North Bay courtesy of my visiting sister. This morning I completed a first pass through "A" (not including "A"-24, which is after all mostly in another languagemusic). Much of it is more comprehensible than The Cantos; on the other hand, the extensive documentation available to help a reader through Pound's allusions and references simply isn't available for "A". Toward the end he really hits his stride in terms of transforming condensare into an absolutely Zukofskyan intensity: that peculiar five-word-per-line form he seems to have invented for "A"-21 (the Plautus playI'm very glad I got to see it performed at the Centennial Conference last year) and which somehow in my mind gets married to a certain essential Latinity, the particular prickliness and syntactical ambiguity of that language when brought bones dripping into English (you see it in Milton toointeresting to see Zuk pick on Stevens for adapting Milton too literally in one of Stevens' poems). For my purposes I was struck by "A"-22 as a kind of pastoral/natural history, and the play too is an obvious precursor of The Tempest. My focus in the chapter will probably be on the this late Latinate Zukofsky: these sections of "A" literally predict 80 Flowers, the crown atop "A" as Ronald Johnson's The Shrubberies seem intended to crown ARK. My sister Vanessa is visiting is for a few days, all the way from California. Ithaca is looking its best, if a little dry: not too hot, spectacular tumbling clouds. Yesterday the three of us just sat around and talked about our lives: it's nice. Taking note of remarks made by Eric Selinger on my "credo" as a secular Jew, and Joshua Clover's dark logic about the strategizing behind the Gaza pullout (summary: Gaza is a knight or bishop sacrificed in the chess game of Israeli nationalism, a game they still intend to "win"), I am forced to wonder if what I think of as my Jewishness isn't merely another name for naivety. Or: I'm beginning to understand that for me the category "Jew" partakes inevitably of both a particular secular culture (yes, I've been watching the "Secular Jewish Culture" video over at PennSound: I've seen the Bernstein, Rothenberg, and Perloff segments) and of the religious, in spite of my shoddy religious education (no Hebrew school, no bar mitzvah, even). When I think about what attracts me to Jewishness (here I'd like to point your toward Kennneth Koch's poem, To Jewishness), it's a complex melange of wry, deprecatory humor; an instinct for siding with the underdog; an appetite for knowledge and the keen analysis of texts and laws; a healthy skepticism; and a sense of moral responsibility that can skew into the parodic "Jewish guilt" of a Woody Allen but manifests most profoundly as a concern for justice. And so I've been especially proud of the history of Jewish educators, radicals, socialists, thinkers, etc., but I'm coming to see that however secular their commitments, there is a continuity between working for justice as they have and the belief in the Jews as a chosen people and in the possibility of messianic transformation. I feel these things on a gut level: my own sense of outsiderness, my hope, have a Jewish flavor. But most of my Jewish heroes predate the State of Israel; I am disaporic to my bones and have never really known what to do with the fact of a Jewish state, Jewish "insiders," and most disturbingly, Jews whose sense of justice doesn't seem to go beyond self-entitlement. To any Jew or Israeli who argues that we're simply acting in our best interests like any other nation or government would, I want to respond: we're supposed to be better than that. (Not so different from my response to those who invoke "America" as justification for any number of acts that have nothing to do with freedom and equality.) So my relationship to Israel is a very uneasy one. It's time, probably, for me to start learning more about the peace movement there; I know there are millions of Jews who want peace and justice but who also want their own state, their own subjectivity, their own power. That's a viewpoint I don't yet grasp entirely; I don't know where to look for examples of power married to an authentic passion for justice outside of the comic books. Power is never pureand the thirst for purity is nothing if not religious. Yeah, I could learn Hebrew. Maybe I will someday. But for me to become a religious Jew would seem require a paradoxical embrace of impurity, for no living congregation can equal my roster of intellectual heroes. And I'm wary of yielding to the frighteningly primitive pull of the ethnic, a community based largely on the brute fact that my Jewish body shares something with other Jewish bodies. There's something real/Real there and it fascinates and appalls. For now I hold myself aloof, and ask questions, and worry. Pretty damn Jewish, no? What's going to happen in Gaza tomorrow? I am hoping for a political miracle: that the expected violence from the hardline settler faction will not materialize, that the withdrawal will be peaceful, that this is the beginning of the end of the deadlocked suffering both sides have inflicted on each other and themselves. Is it unreasonable to hope for such miracles? How can we not? Rage, self-immolating rage, coupled with sick (nauseated/nauseating) humor, is the primary affect of Kent Johnson's Lyric Poetry After Auschwitz: Eleven Submissions to the War. The title contains the whole program: standing behind Adorno's infamous saying is Benjamin's moral paradox, "There is no document of civilization that is not also a document of barbarism." This book is indisputably both: a document of a very particular, one might even say mandarin, aspect of American civilization (both a "high" civilization, as "lyric poetry" suggests, but also in a more daiy sense, simply life as it is lived, throwing a match on charcoal briquets) and a document of the barbarism that precedes, sustains, and most terribly, comes after such civilization: the barbarism we accept in the name of continuing our "way of life." It is an absolutely untenable posiiton that most of us inhabit at the cost of ideological blinders or cognitive dissonancethe latter often manifesting in the poetry which I believe Johnson's work is just a more extreme, naked version of. Isn't the contempt and self-hatred that so often manifests in discourse around contemporary poetry, often enough in the poems themselves, not only the rage of those without the cultural capital of, say, a filmmaker (but look what most of them do with it! but look, as I just did, at Miranda July's new film Me, You, and Everybody We Know, a film not about the war yet indisputably contemporary, evocative of the pain of unflourishing, in ourselves and our neighbors) but the rage of those who cannot find an audience that might listen and be changed, that might learn to hope and act. That this is Kent's position is manifested most obviously in the now notrious Afterword in which he denounces Charles Bernstein's attack on the Poets Against the War anthology/site as being insufficiently challenging to linguistic norms: Kent is offended by their insistence on business as usual, that is, their commitment to remaining poets as they are. And so Kent's book is addressed, suffocatingly, to himself; I think many of those enraged or repulsed by the book identify with the exruciating moral position that he occupies and see him setting himself up as a self-righteous accuser, a misprision made more likely, maybe inevitable, by his use of so many proper names, most notably in the "Mandrake" poem (a parodically overwrought new form, intended perhaps to gesture at the futility of trying to resolve moral/political dilemmas with new poetic forms), "The New York School (or: I Grew Ever More Intense)." The poem is an unresolved dialectic of documents in which canonical and semi-canonical NY School poets are transformed, literally, into hygiene products ("flowers") against an Orientalist backdrop that cannot but fail to erase the stink of the "fruits," italicized passages of eyewitness accounts of horrors and suffering perpetrated by the U.S. and its proxies (though there are some curious transpositions). The last paragraph imagines a "lucky" Japaense poet collecting mushrooms with his son in the forest, who sentimentally asks himself, "How is it possible the years have gone by like they have and that I will never get them back? How is it that this world is full of sufferinng and hurt? ... I guess I've been pretty lucky after all, enjoying the pleasures of calligrapy and sake in all the surplus time the labor of others has more or less made for me. Some of us are like rain, and others of us are like the thirsty grounnd, and others of us are like parasitical mushrooms, especially poets, and that's just the way things have come to be. The truth is that I felt like running back down the hill as fast as my legs would take me, shrieking, seeking I do not know what." The path out of poetry? The path from poetry to politicseffective politics? Can poetry survive outside of its forest? Should it? This powerful, unsettling, maddening book raises these and many more questionsquestions that I think most poets of any value have already been asking for a while now, these questions that stick in our throats. But Lyric Poetry After Auschwitz is a valuable document nonetheless. It could not have been produced at any other time but now. we have never read any other that equals its mastery. which imparis but our own offices. 1871. Henry Adams. My book is out ..
much better in any other ..
Hardly indifferent, L.Z.! We fool ourselves, but no one else. There's a lot of good sense in Ron's discussion of book prizes yesterday, and in the comments field too. I think Norman Finkelstein has a great point about how communities cannot simply be the opposite of an "administrative" function: how they tend to foster their own administrations and by so doing become institutions. "The New York School" is certainly an institution now, as is "Language poetry"; their texts are "classics" in the sense of being that which forms the background against which we write, a network that efficiently administers who should be included and excluded (actively resisting that administration is a vital component of much of the most interesting contemporary work). In that sense Ron himself is one of the most active and visible administrators, as today's post on Annie Finch seeks to "rescue" her from the camp of New Formalists and claim her for "our side." Of course poets are not pawns in the hands of such administrations: we can and do actively choose who we will be affiliated with. The question for a young poet is, do I seek my primary affiliation from my peers or from an elder? The MFA model seems to lean heavily on the latter, as does the contest judged by a "name." You can and do discover peers in an MFA program: for me that's been the most enduring benefit of my Montana experience (along with my discovery of a taste for scholarshipa discovery that still surprises me in retrospect). 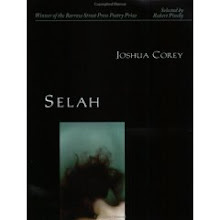 The contest model creates peers only in the most generalized way, as an administrative category with little love attached to it: I glanced into the New York Review of Books yesterday and saw an ad for some university press' "prize-winning poetry." 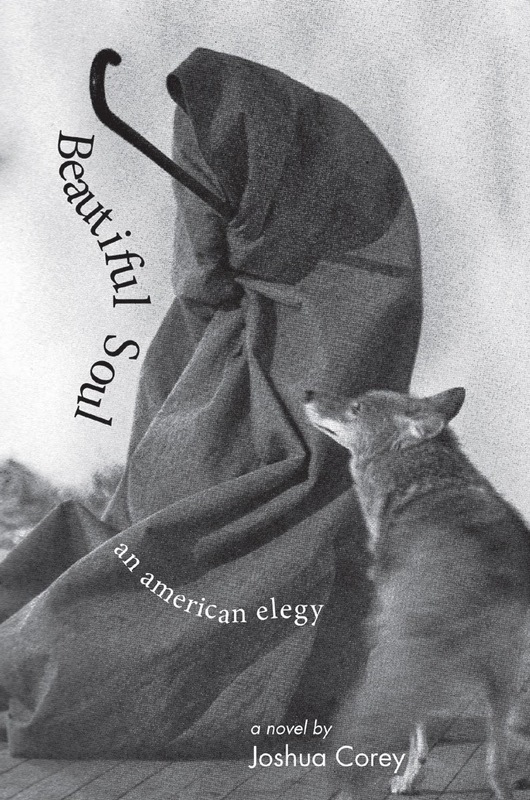 But it is possible for a contest from a small press to both fund publication and foster community: that's certainly been my experience with Spineless Books (and let me refer you again to this lovely essay on the subject by Dirk Stratton). Administration does have its uses for those of us seeking academic jobs: winning a prize or publishing with a larger press provides reassurance to those who don't have the time or perhaps the confidence to evaluate the work themselves. I think only one's personal integritysomething there is no certificate forcan guard against the degradation of one's writing to a commodity, a bullet-point on the c.v. And vice-versa: those who egocentrically exploit academia, who give short-shrift to their students and their own intellectual responsibilities, are guilty of the same crime of half-heartedness. Gearing up now for the academic job search. And I've had an epiphany about my dissertation: it makes much more sense to focus on just the three major poets who have most preoccupied me (Pound, Zukofsky, Ronald Johnson) than it does to devote time to groups like the New York School (even though I was planning to focus on Schuyler) or that so-far vague entity of "contemporary negative pastoralists." Cleaner, more elegant, more scholarlythere will be time to expand into those other areas when it's time to turn it into a book. A DISSERTATION IS NOT A BOOK. This must be my mantra if I'm to get out of here alive. And this decision means, glory of glories, that my dissertation is halfway done. Back from a terrific weekend at the Newport Folk Festival. Newport itself is just festering with wealth, with immense and often beautiful mansions surrounded by immense and beautiful yachts; as Elvis Costello said Sunday, surveying Narrangasset Bay, "It makes you think, the squalor some people have to live in." The New England landscape has a powerful effect on me, a legacy from summers spent in Maine when I was a child. And hey, the music was great too. I'm no folkie, but fortunately neither were many of the artists. After a long day in brutal sun on Saturday I was moved to my feet and to the front of the stage by a performance by The Pixies: they were electrifying and plenty loud on putatively acoustic instruments. Black Francis and Kim Deal have charisma to burn, especially Kim smiling enigmatically behind her enormous bass guitar with a cigarette clamped in her teeth. Sunday was even better: the sun wasn't as punishing and there were two performances invoking the war that created that unified the crowd in a spirit of agape that I haven't felt since Election Day. The first was by Conor Oberst, aka Bright Eyes. I hadn't really listened to him before and was skeptical at first, but he totally won me over. The man has incredible star power: it was instructive to see him taking the stage with two other very accomplished musicians, M. Ward and Jim James. They were fine players and singers, particularly Ward, but when Oberst was on stage you couldn't take your eyes off him. The showstopper was a long sort of ballad that moved from an articulation of the usual twentysomething angst into something more powerful, a narrative that captured the alienation of all of us on the Left who for all intents and purposes have no voice in public life right now, at least not on the national level. In the crucial moment, eyes burning, Oberst sang a line that went something like, "And if you're still free, you'd better start running, because we're coming for you!" and then swung away from the audience in a gesture that elevated rock star contempt into something more complicated: the shame and self-loathing we feel at the things done in our name, mixed with a purifying rage. That may be something art can do: gesture at the space we already occupy, pulling people together and reminding them that solidarity is possible. The second such performance was Elvis Costello's: a terrific showman, and his showstopper was a haunting performance of "Scarlet Tide." When he sang, "Admit you're wrong, and bring the boys back home" (and then refrained it as, "Admit you LIED, and bring the boys back home"), we were all on our feet and crying. I think we all felt a glimmer of the old countercultural soul of the festival, not quite effaced in spite of corporate sponsorship and the maudlin melancholy of a few of the performers. It is possible for music to be political, to manifest a political will. It is possible. Speaking of self-loathing and rage, I've been following the controversy over Kent Johnson's Lyric Poetry After Auschwitz with growing bemusement and distaste. I suspect that after a great deal of polemical scurrility (and some very low blows) we still haven't heard what's important about this book. Kent has sent me a copy and when I've read it I expect I'll have a few thoughts. You can order via paypal at http://www.carvepoems.org. Tomorrow Emily and I are driving to Newport, Rhode Island for the Newport Folk Festival (sorry, the "Dunkin' Donuts Newport Folk Festival." Sheesh). I am not a great lover of folk music, but an acoustic set by the Pixies was too much for me to resist. Elvis Costello, Bela Fleck, Richard Thompson, and Emmylou Harris are other major draws. More deadpan genius from Nada: a parody of that ridiculous profile of August Kleinzahler in the NYT the other day. I am going over my second chapter before submitting it to my committee. It's not bad, though I'm struck by how after all the theoretical flights I take when I sit down to write I mostly produce close readings. I'm struck by the fact that I've been overusing the word "struck" or "strikes," particularly in constellation with "by the fact." Clearly cognition has a violent edge for me. Another bit of Grossman, this one in strange correspondence to Nada's Laura Riding post:"Poetry in the usage of Western language may sometimes be called 'divine' or sacred; but for the Jew there is always a sense (a profound understanding beneath all other understandings) that the category of the sacred and the category of the poetic repel one anotherbecause the poetic defers the sacred, which is, nonetheless, the destination of all things." For "sacred" here we might read "the good," the poetic that which represents the good (but can therefore by definition never be the good). For "Jew" we might read the poet who waits upon the good, who seeks it with the only/the inadequate means. My poems are addressed to some state of the persons around me other than that which they currently find themselves in. My poems should be addressed, are intended to be addressed, not to the present powers, but to the future powers of my readers. I believe that poems should not be addressed to the already possessed states of consciousness of the persons who read them. Poems should have an empowering strangeness about them which summons its audience rather than receives its audience. Nada has it going on today. I like the Laura Riding critique. And this paragraph: "I know there are many poets who, to borrow Riding’s term, want to transubstantiate their ardor for the good into their poems. In doing so, they can create interesting effects, because their ardor will fight with their form’s inherent ineffectuality. But “at the end of the day” they are still creating interesting effects." Does she mean, "and that's all they're doing," or does she mean that interesting effects are a necessary by-product of trying to realize the Good in a poem? Guess I'm just rephrasing it. And I love the Boston Terrier photo, of course. Books taken with me to NYC: Zizek, The Ticklish Subject (read parts at The Cloisters); Gershom Scholem, Walter Benjamin: The Story of a Friendship (read parts on couch and in garden of Upper West Side apt. ); Ben Lerner, The Lichtenberg Figures (read on train). Book acquired in NYC: Keith Waldrop, The Opposite of Letting the Mind Wander (read at Starbucks). Magazines acquired in NYC: The Canary Issue Four; n+1 Issue Two; Time Out New York (with a cover story on The Aristocrats). "Indeed," I finally said, "as a six-foot-tall first-generation Turkish woman growing up in New Jersey, I cannot possibly know as much about alienation as you, a short American Jew." He nodded: "So you see the problem." Not the least interesting observation made by Greif is that the policy failures of the Bush Administration have prevented it from what had seemed like a march into full-bore Fascism: in a gesture of oddly exhausted optimism, he writes that "Bush's reelection may be a disaster, but the moment of real danger, when it seemed a totalitarian consolidation might occur, may also have passed. We can be curiously relieved that Bush is distracted with destroying the social and economic fabric of the United States, through the dismantling of Social Security, retention of tax cuts, and enlargement of deficits, rather than developing his internal security apparatus." I don't fully identify with his optimism (this piece was written before Congress made the Patriot Act permanent) or his fatigue: to quote Arlo Guthrie midway through "Alice's Restaurant," "I'm not proud... or tired." Maybe there is a sense in which we can be thankful that 9/11 has not yet served as the political event around which a truly terrible reaction can consolidate its power. But I'm more interested in whatever groundwork might be necessary in anticipating the event to come. Not a messiah, not even a political savior (Barack Obama, anyone? ), but a genuine advance in the realm of economic justice and political rights. Something newer than the New Deal to capture our imaginations. Some impulse surpassing the image. Books received: Ange Mlinko, Starred Wire; Ted Mathys, Forge (both from Coffee House Press). My thanks to Matt for his beautiful introduction, and to him and his wife Katie both for their services rendered to poetry.